Slight risk of tornadoes rest of day, then beautiful weekend; fireworks wet? 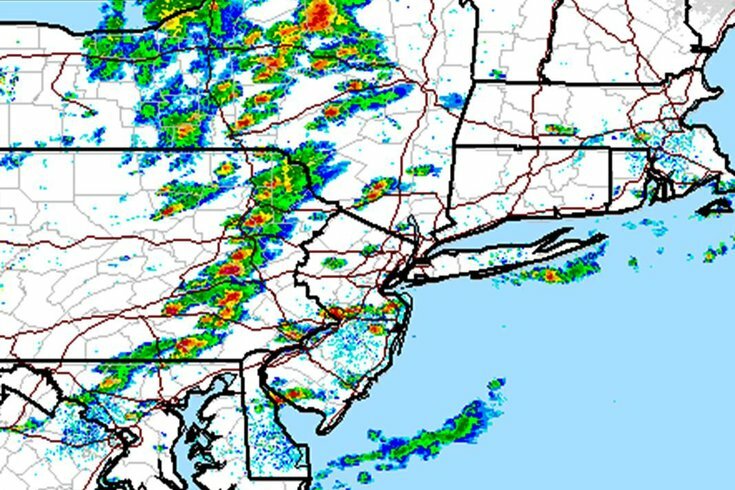 Enhanced radar from the National Weather Service showed a long line of storms moving eastward through Pennsylvania about 2:35 p.m. Friday. A cold front swinging through the Philadelphia region this afternoon and tonight will bring a slight risk of tornadoes. Otherwise, more tame thunderstorms and showers, like the one that rolled briefly through Center City around 2 p.m., are likely, according to the National Weather Service. Still, heavy downpours, strong winds and large hail are possible through the period in some locations. A severe thunderstorm watch has been posted through 10 p.m. Friday. Once the cold front clears out around or after midnight, high pressure builds for the weekend, with clear and dry weather, and abundant sunshine, and only a few chances of precipitation. Temperatures are expected in the mid-80s, both days. Backyard fireworks: Will it get you arrested? Most of the area will remain dry but under mostly cloudy skies during the day on the Fourth, but a southerly wind will arrive and moisture will again increase, forecasters said. The chance of showers and thunderstorms increases Monday night about 9 p.m., threatening to rain on area fireworks displays. For those spending the holiday weekend at the Jersey Shore and Delaware beaches, there is a low-to-moderate risk of the formation of dangerous rip currents through Monday. Friday: A chance of showers, then showers and thunderstorms likely after 4pm. Some of the storms could be severe. Partly sunny, with a high near 87. South wind around 10 mph, with gusts as high as 22 mph. Chance of precipitation is 60 percent. New rainfall amounts between a tenth and quarter of an inch, except higher amounts possible in thunderstorms. Friday night: Scattered showers and thunderstorms, mainly before 3am. Some storms could be severe, with large hail and damaging winds. Mostly cloudy, with a low around 66. Southwest wind around 7 mph becoming northwest after midnight. Chance of precipitation is 50 percent. New rainfall amounts between a tenth and quarter of an inch, except higher amounts possible in thunderstorms. Saturday: Sunny, with a high near 85. West wind 9 to 11 mph. Saturday Night: Mostly clear, with a low around 63. West wind 3 to 8 mph. Sunday: Mostly sunny, with a high near 86. North wind 5 to 8 mph becoming southwest in the afternoon. Independence Day: Partly sunny, with a high near 86. Monday Night: A chance of showers and thunderstorms. Mostly cloudy, with a low around 69. Chance of precipitation is 30 percent. Tuesday: A chance of showers, with thunderstorms also possible after 8am. Partly sunny, with a high near 87. Chance of precipitation is 30 percent. Wednesday: Mostly sunny, with a high near 91. Friday: A slight chance of showers, then scattered showers and thunderstorms after 5pm. Some of the storms could be severe. Patchy fog. Otherwise, mostly sunny, with a high near 77. South wind around 11 mph, with gusts as high as 21 mph. Chance of precipitation is 30 percent. New rainfall amounts of less than a tenth of an inch, except higher amounts possible in thunderstorms. Friday night: Scattered showers and thunderstorms. Some storms could be severe, with large hail and damaging winds. Mostly cloudy, with a low around 66. South wind 7 to 13 mph. Chance of precipitation is 50 percent. New rainfall amounts between a tenth and quarter of an inch, except higher amounts possible in thunderstorms. Saturday: Sunny, with a high near 82. West wind 11 to 14 mph. Saturday Night: Mostly clear, with a low around 64. West wind 3 to 8 mph. Sunday: Mostly sunny, with a high near 78. Light and variable wind becoming south 5 to 9 mph in the morning. Independence Day: Mostly cloudy, with a high near 82. Monday Night: A chance of showers and thunderstorms between 9pm and 3am, then a chance of showers after 3am. Mostly cloudy, with a low around 69. Chance of precipitation is 30 percent. Tuesday: A chance of showers, with thunderstorms also possible after 9am. Mostly cloudy, with a high near 83. Chance of precipitation is 40 percent. Tuesday Night: A chance of showers and thunderstorms before 9pm. Partly cloudy, with a low around 69. Chance of precipitation is 40 percent. Friday: A chance of showers, then showers and thunderstorms likely after 5pm. Some of the storms could be severe. Mostly cloudy, with a high near 80. South wind around 7 mph. Chance of precipitation is 60 percent. New rainfall amounts between a tenth and quarter of an inch, except higher amounts possible in thunderstorms. Friday Night: Showers and thunderstorms likely, mainly before 8pm. Some storms could be severe, with large hail and damaging winds. Mostly cloudy, then gradually becoming mostly clear, with a low around 54. Southwest wind around 7 mph becoming northwest after midnight. Chance of precipitation is 60 percent. New rainfall amounts between a tenth and quarter of an inch, except higher amounts possible in thunderstorms. Saturday: Sunny, with a high near 74. Northwest wind 9 to 11 mph. Saturday Night: Mostly clear, with a low around 53. West wind 6 to 8 mph. Sunday: Mostly sunny, with a high near 78. Northwest wind 6 to 9 mph. Independence Day: Mostly sunny, with a high near 79. Monday Night: A chance of showers and thunderstorms between 9pm and 3am, then a chance of showers after 3am. Mostly cloudy, with a low around 59. Chance of precipitation is 30 percent. Tuesday: A chance of showers, with thunderstorms also possible after 9am. Mostly sunny, with a high near 79. Chance of precipitation is 30 percent. Tuesday Night: A chance of showers and thunderstorms before 9pm. Partly cloudy, with a low around 61. Chance of precipitation is 30 percent.